In 1998, while living north of Boston, I co-founded an internet services company in Atlanta. The following year, when the venture got traction, my family and I left New England, moved to the South, and began a new chapter in our lives. For the next eight years, when not consumed with work, I explored much of the region with my family. Moving from the Northeast was quite a change, but not for the typical reasons. For us, we gave up regional character, culture and cuisine. For those of you who read the blog I write with my wife, The Two Palaverers, you know why I borrowed that alliteration. Immediately, we began our quest to discover what we left a thousand miles behind. Happily over time, we found it in places like Charleston, South Carolina, Savannah, Georgia, and Natchez, Mississippi, but we knew we hit the jackpot with Louisiana. For years, we made many visits to Louisiana, exploring much of the state. Each trip offered a different, more stimulating experience, whether it was eating alligator in Lafayette, watching a Sunday service procession along the Mississippi River south of Baton Rouge, or listening to an emerging jazz trio near Tulane University. Louisiana has soul. 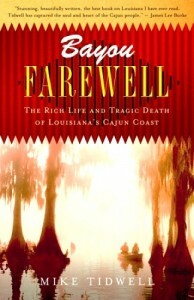 In 2004, at a local bookstore in Atlanta, I came across a book called Bayou Farewell by Mike Tidwell. Because my reading queue was continuing to expand, I resisted the purchase, but returned the following day and bought it, putting it at the front of my reading list. A few days later it was read. From the start, Tidwell hypnotized me with his chronicle of the people south of New Orleans in Cajun country and on the Gulf. He methodically navigated such diverse subjects as culture, shrimpers, boat maintenance – and oil. He successfully captured the essence of this part of Louisiana. Not long after reading the book, I retraced many of Tidwell’s paths through Cajun country and such small towns as Leeville, Galliano, and Golden Meadow. The more I saw, the more I was convinced – and concerned – by how ecologically fragile this region was. Decades of silt loss from the Mississippi and pipeline runs through the swampland were having a range of effects from land erosion to wetland depletion. Today, we’re all shocked by the endless flow of oil and images from the massive leak in the Gulf. Oil from this region is important to both the people of Lousisiana and the rest of us around the country. I’m sure we’ll have more insight to the cause as the seepage stops. Like every catastrophe, I expect there to be no shortage of warning signs ignored. We won’t know the ultimate impact on the inhabitants or environment for some time. Hurricane Katrina knocked Louisiana down, but it survived. This oil spill, though, is different. I hope it’s not Bayou Farewell. Reports today that the “top kill” method of stopping the leak have failed. I’m having a tough believing that (1) there are not sufficient contingency plans and (2) there are not sufficient capabilities to address the problem. It’s tough for BP to defend its efforts when CNN is showing a live feed of the leak.